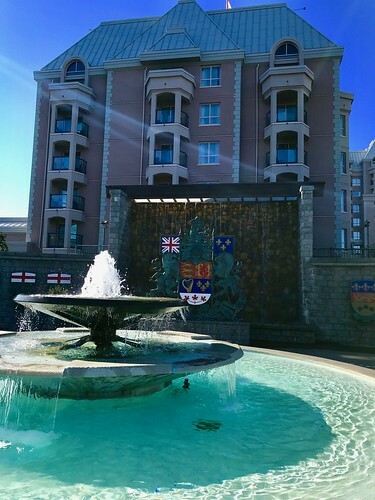 My family and I spent Spring Break 2019 back in the country of my birth – Canada. 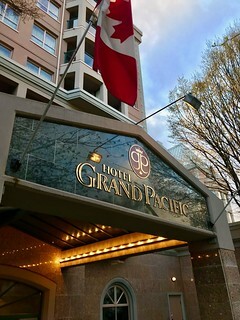 We opted to visit Victoria, British Columbia and were thrilled to connect with the beautiful Hotel Grand Pacific. This one is an easy one. 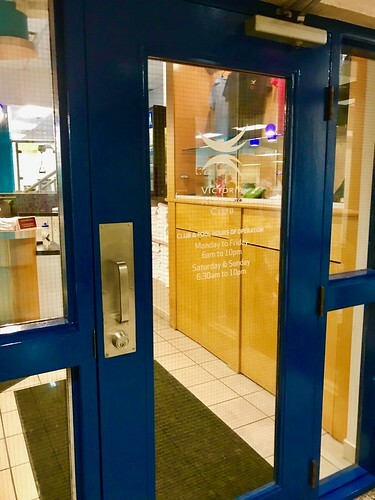 The GoodLife Fitness Victoria Marathon is actually the main reason why I decided to drag my wife and kids to the city for Spring Break in the first place. We connected a little with them last summer to showcase their 2018 event, and just looking at the course and the pictures really got my travel juices flowing. I KNEW I needed to check out the course, either on race day or otherwise. 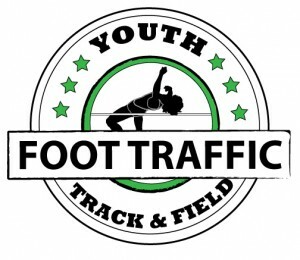 This race takes place in October each year (10/13/19) and the course is a fast and flat Boston Qualifier. Runners will start just south of the famed Parliament Building and do a quick jaunt through downtown Victoria. Full and half marathon runners will meander through the awesome Beacon Hill Park before hitting the coastline and running along the water for a bit (8k runners will just run the outskirts of the park). 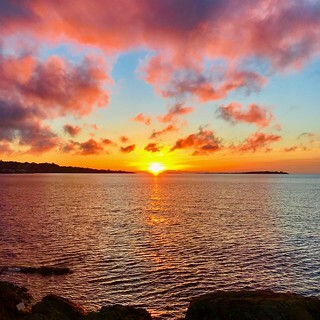 This is followed by some neighborhood running in the Fairfield area that will eventually spit runners out to Oak Bay on the south and east side of the island. On the first morning we were there, I took off on a pre-dawn run on the first 1/3 of the course or so and managed to get this picture around the 4.5 mile mark of the course. I mean, does it get better than that?! 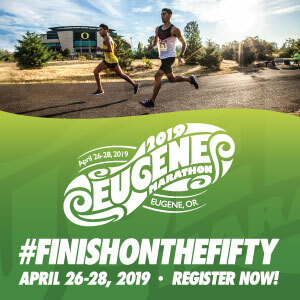 After the longer races hits their halfway point, its a return to the start, but continuing along the coastline even longer before hitting Fisherman’s Wharf and finishing up back in the heart of Victoria. Register here if you are interested. And since we are talking about the Hotel Grand Pacific, this is literally the perfect spot to be on race day as the races kick off and end essentially within a block of where you would be laying your head. No need to worry about leaving too early or finding somewhere to park. It’s perfect! 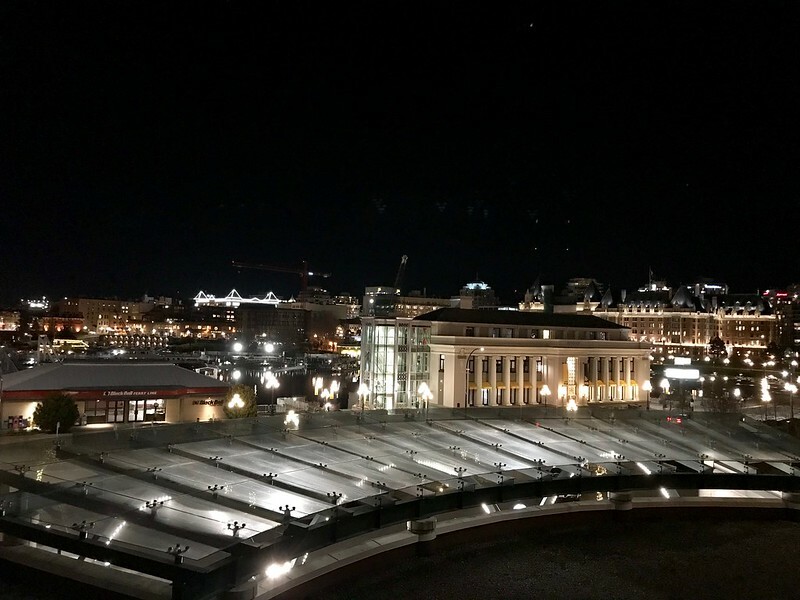 If you are looking for a secondary spot to run, I recommend heading north from the Inner Harbour, crossing west over the Johnson Street Bridge, and easily merging on the Galloping Goose Trail, which can take you for miles and connect you with all sorts of other great running options. First and foremost, the location is just perfect. After a long day of driving from Salem, waiting in security lines, and riding the ferry across the water, I was so pumped that we didn’t have to then drive and figure things out with our lodging. The Hotel Grand Pacific is literally across the street from the Port Angeles Ferry Terminal and took us less than 30 seconds to get there once we got our passports checked. 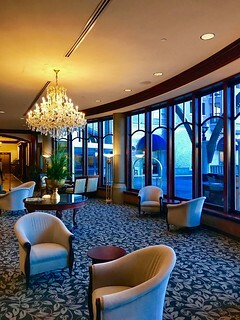 Both the outside visuals and the indoor lobby areas were beautiful (see above) and everyone – from the valet (not required, but it was absolutely clutch for a family of 5) to the front desk to the cleaning staff – was super friendly. 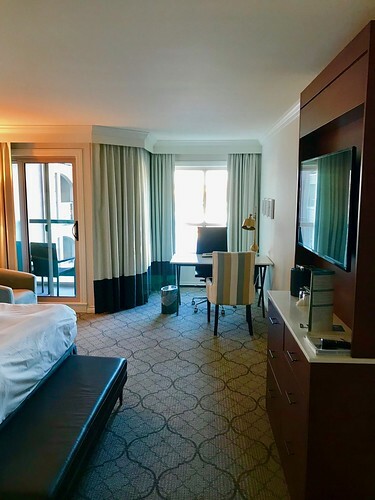 The room itself was pretty simple, but was perfect in all the ways we needed – cleanliness, comfortable beds, and a small patio that overlooked vibrant the Inner Harbour. 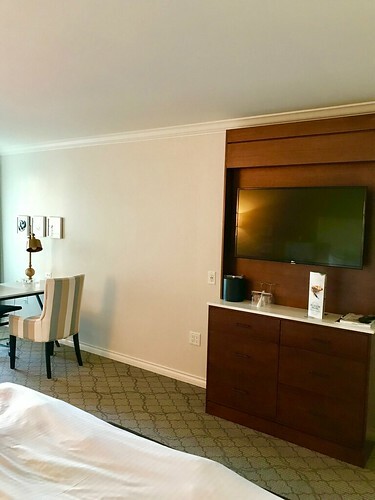 Hotel Grand Pacific has three on-site dining options, so if you don’t feel like trudging over to the downtown area, you have some solid choices. The Pacific Restaurant & Terrace is open for all three meals of the day and showcases local and seasonal ingredients. They also have a great outdoor patio when the weather cooperates. The Pacific Lounge is open for lunch and dinner and is more of a cocktail bar in atmosphere – with light and casual meals and beer, wine, and spirits. 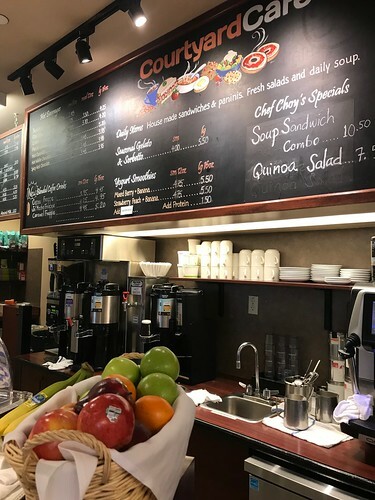 Finally, The Courtyard Cafe offers a simple place to grab stuff on the go or just grab something that doesn’t require a whole dining experience. They make paninis, sandwiches, soups, and in-house bakery items, as well as specialty tea and coffees. It’s just a nice little cafe that rounds out a great trio of spots. 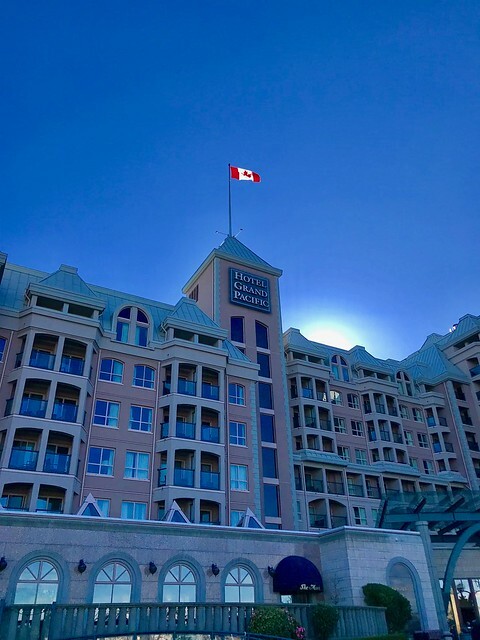 Whether travelling with kids, or for the Victoria Marathon, Hotel Grand Pacific has you covered for working out and/or relaxing. 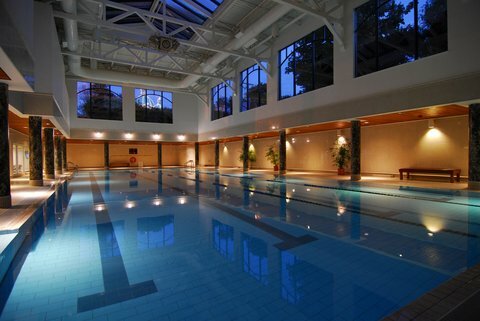 If you are looking for fitness, they are directly attached to the Victoria Athletic Club. They have a fitness studio with 4+ classes per day of HIIT, Yoga, Zumba, and others (this is an extra cost). However, hotel guests receive complimentary access to the squash court, sauna, fully-equipped weight room (not just a tiny one with 1-2 machines) and cardio center with elliptical and treadmills that overlook the pool. Speaking of pools, if you do happen to be travelling with little ones, they won’t be disappointed. While there are always some lanes in their 25 meter pool available for working out, there is a large area for casual swimmers to mess around in (and doesn’t get deeper than 4 feet). For the smaller ones, there is a shallow kids pool that is a lot of fun to splash around in (I can attest to this). We also decided to do some exploring of the city and just use the hotel as our “home base”. Due to it’s centralized location, pretty much all of the fun touristy stuff is within walking distance. We toured the inside of the Parliament Building (which is right next door) and then headed over to the Royal BC Museum, which was just a minute walk past that. While we couldn’t get to every cool restaurant and bar that my wife and I wanted to, we did find a bunch of fun restaurants downtown (we filled our bellies at Mo:Le, Frankies Modern Diner, Cafe Mexico – good tequila – and of course Tim Horton’s). We also checked out Miniature World, the Victoria Bug Zoo, Craigdarroch Castle, and Fisherman’s Wharf. I surprisingly didn’t hit up many of the downtown breweries on the Victoria Ale Trail (only made it to Spinnaker’s), but we did head further north on the island to go to the famed Butchart Gardens, followed by the Victoria Butterfly Garden and two breweries – Category 12 (which could fit nicely in here in Oregon) and Twa Dogs. There is currently no ride sharing in Victoria, but the hotel has a great complimentary Bike Program, offered seasonally, where guests can check out some cruiser bikes for up to 2.5 hours and tour the city (comes complete with helmets and locks)! So even if your feet are tired after a marathon or half, you can still get around no problem. 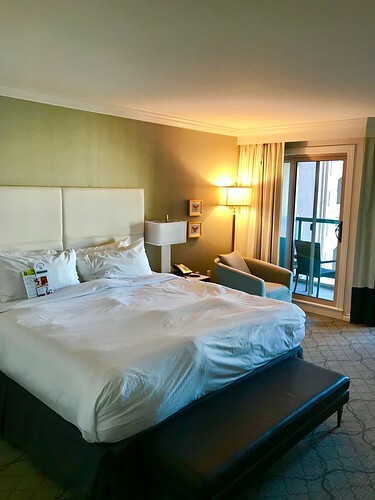 We were blown away by just how awesome our experience was at the Hotel Grand Pacific. From the convenient location to the upscale look and feel without the expected snobbishness, it was just ideal. Our rooms were clean and comfortable, everyone was super friendly, and we were never too far away from anything we wanted to do. I am not sure we would stay anywhere else when we assuredly return (look out Victoria Marathon 2020)! Many thanks to the Hotel Grand Pacific for allowing us to check out their property! Please read our transparency page for info on how we do our reviews.